After reviewing a diverse collection of 23 submissions, an expert jury has selected a total of six winners—two first prizes of €10,000 each and four second prizes of €3,500 each—in the 2018 GBIF Ebbe Nielsen Challenge. The solutions and innovations devised by the winners—and, indeed, all the entrants—reflect and address topics of wide-ranging interest and concern in the biodiversity informatics community, like linked open data, data mobilization, and data quality and interoperability. The Challenge is an annual incentive prize that honours the memory of Dr Ebbe Schmidt Nielsen, an inspirational leader in the fields of biosystematics and biodiversity informatics and one of the principal founders of GBIF. The recipients are share a larger-than-normal share of prize money thanks to an earlier contribution from the Swedish Research Council, which went unawarded in last year’s Challenge. The team of Lien Reyserhove, Damiano Oldoni and Peter Desmet from INBO, the Flemish Research Institute for Nature and Forest, cooked up Checklist recipe, an automated routine that uses the R programming language to generate species checklist datasets. This recipe solved an ongoing need for the Tracking Invasive Alien Species project (TrIAS), which aims to support evidence-based policies on invasive and alien species (IAS). As the team’s submission noted, “Standardizing biodiversity data to Darwin Core can be hard.” Their template GitHub repository provides a transparent, open, and repeatable process for mobilizing and publishing thematic species checklists from diverse sources. 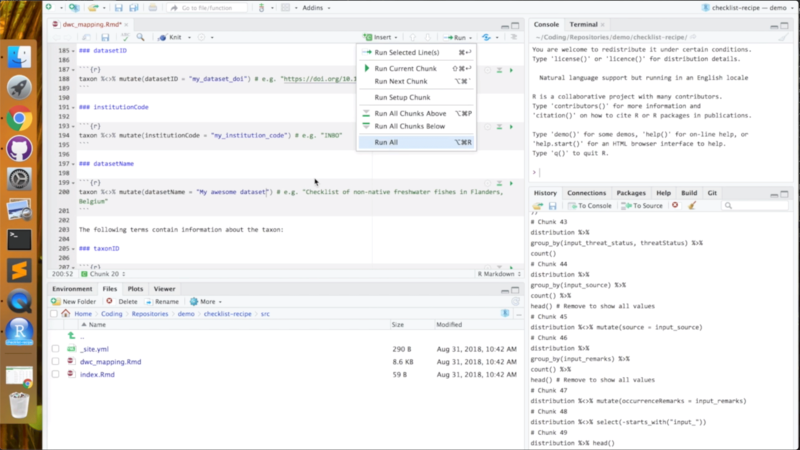 Users with a basic knowledge of R can copy—or ‘clone’—the repository, customizing the code to fit their needs while transforming source data files into a standardized Darwin Core checklist. The recipe also supports several essential parts of the data processing workflow, including iterative versioning and data validation, mapping, correction and republication. The team is now working to reuse the open checklist data they’ve already published to create a reproducible national list of alien species in Belgium as part of the Global Register of Introduced and Invasive Species. 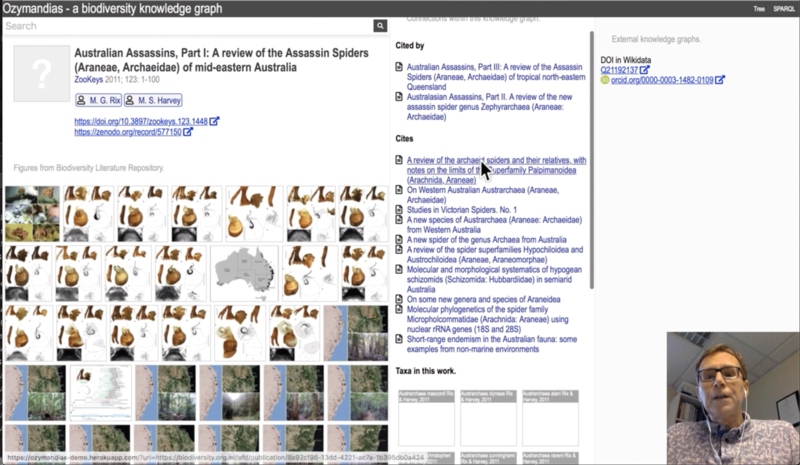 The initial prototype for Ozymandias submitted for the Challenge combines a classification of animals from the Atlas of Living Australia with data on taxonomic names and publications from the Australian Faunal Directory. Common identifiers like DOIs (Digital Object Identifiers) for articles, LSIDs (Life Science Identifiers) for taxonomic names, and ORCIDs and WikiData IDs for people trace back to their sources in scientific journals, scanned literature from the Biodiversity Heritage Library, citation events from CrossRef and figures from Plazi’s Biodiversity Literature Repository. Even constrained to the scale of a single continent, Ozymandias enables casual users, students and researchers to explore millions of relationships and use any part of it as the entry point for investigation, focusing on knowledge of a particular species, the range of a researcher’s activities or the research output associated with a particular institution. Page hopes that future iterations of Ozymandias will add links to specimen and sequence data while expanding its taxonomic scope and geographic range. The aspirations of this Challenge submission are high: creating nothing less than a general framework to bridges between all biodiversity data users and the R ecosystem while promoting the standards and methods of the Biodiversity Informatics community. Led by Tomer Gueta and Yohay Carmel at The Technion – Israel Institute of Technology in Haifa, the competition’s most diverse international team assembled six unique R packages in a hierarchal structure that tackles distinct functions. From standardizing fields and checking and cleaning issues to preparing visualizations and reports, each package operates on a collection of user-friendly Shiny apps and a complete set of R functions. The “Ebbe” version of the bdverse comes in advance of an official release planned for January 2019. The team now is now building a testing framework with continuous integration and is eager get feedback about bdverse’s architecture, its features and its user interface. Improving the quality of previously published data can be time-consuming job, especially for collection managers responsible for large datasets. The Challenge entry from Luis Villanueva of the Smithsonian Institution seeks to simplify the process of reviewing issues flagged in individual occurrence records. The application provides a web interface that enables users to browse issues by dataset, highlighting patterns, trends and other relevant information. Meanwhile, the tool displays inline images, key columns (like coordinates, location, and country), links to the collection database and a map to help collection managers sort out where the problems reside and how to fix them in subsequent updates. Researchers can also use Issues Explorer to check datasets and gauge their suitability prior to running their analyses. This Challenge entry from Ashish Singh Tomar of the University of Granada offers a prototype web application for visualizing taxonomy trees, allowing taxonomists to edit and to compare a branching graph of evolutionary relationships against the GBIF backbone taxonomy. Tomar has developed the tool as a postdoc in BIG4, a global consortium training a new generation of systematic entomologists—but taxonomists anywhere could benefit from being able to drag-and-drop missing nodes from a reference taxonomic tree into their working taxonomy.